It must be asked, How is it that the people have lost control of the war powers when the Constitution clearly stipulates that war must be declared by Congress? To answer this question, we need to travel back in time to the end of World War II. It is no coincidence that no declaration of war has been issued since the US entered the Great War. It so happens that the usurpation of the war powers began in earnest upon entry into the United Nations. [T]here is no provision in the Charter itself that contemplates ending war. It is true the Charter provides for force to bring peace, but such use of force is itself war…. Not only does the Charter Organization not prevent future wars, but it makes practically certain that we shall have future wars, and as to such wars it takes from us the power to declare them, to choose the side on which we shall fight, to determine what forces and military equipment we shall use in the war, and to control and command our sons who do the fighting. This predicament could not be more alien to the intention of the framers of our Constitution. Here is what Alexander Hamilton said about the war powers in Federalist Paper #69. The President is to be the “commander-in-chief of the army and navy of the United States, and of the militia of the several States, when called into the actual service of the United States. The President will have only the occasional command of such part of the militia of the nation as by legislative provision may be called into the actual service of the Union. The king of Great Britain and the governor of New York have at all times the entire command of all the militia within their several jurisdictions. In this article, therefore, the power of the President would be inferior to that of either the monarch or the governor. The President is to be commander-in-chief of the army and navy of the United States. In this respect his authority would be nominally the same with that of the king of Great Britain, but in substance much inferior to it. It would amount to nothing more than the supreme command and direction of the military and naval forces, as first General and admiral of the Confederacy; while that of the British king extends to the DECLARING of war and to the RAISING and REGULATING of fleets and armies, all which, by the Constitution under consideration, would appertain to the legislature. It is easy to see, then that the framers wished to divide the war-powers. The executive role was to be subordinate to the legislature. In this way, it was seen that either an attack by a foreign power or an act of the legislature would be required in order to break the condition of peace. The executive’s role was to restore the peace by use of the military either in defense of an attack or by commanding the armed forces granted to his use through a declaration of war. One also notices how the states retain their militias and the federal government has no permanent use of them. Here is a check against the military held by the several states. Unfortunately our militia system is dismantled and so a State’s check against a military tyranny from Washington, DC is no longer maintained. To summarize the Constitution, the legislature makes war; the president makes peace. The Senate ratifies the terms of the peace. CONCURRENT RESOLUTION Expressing the sense of Congress that the use of offensive military force by a President without prior and clear authorization of an Act of Congress constitutes an impeachable high crime and misdemeanor under article II, section 4 of the Constitution. That it is the sense of Congress that, except in response to an actual or imminent attack against the territory of the United States, the use of offensive military force by a President without prior and clear authorization of an Act of Congress violates Congress’s exclusive power to declare war under article I, section 8, clause 11 of the Constitution and therefore constitutes an impeachable high crime and misdemeanor under article II, section 4 of the Constitution. Leon Panetta is not describing a military called into service of the United States, but rather a military called into service of the United Nations. One has to wonder about the Constitutionality of the US troops fighting UN sanctioned wars even with Congressional consent since there is no authorization for our military to be called into action on behalf of any other power other than the United States. Of course the argument will be made that there is a shared interest which would certainly obscure the issue. Still, our President has no war powers outside of a declaration of war by congress except under well-defined conditions of emergency defense of our country amid attack. Tom DeWeese of the American Policy Center has compiled and released an invaluable resource for fighting Agenda 21. His youtube video describes, in detail, the contents of this kit. He opens with good news about the progress made so far across the nation in beating back the UN agenda and advises activists that the Agenda 21 backers are revising their terminology again to obfuscate their machinations. The kit includes 2 manuals, a work book, a cd of all the documents and 2 dvds containing 6 talks. Review the video below for more details and pricing. 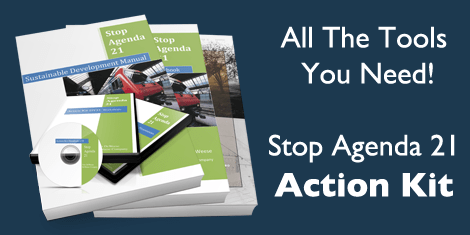 Click here for your Action Kit. Michelle Rhee was the Chancellor of the Washington DC School System. She was given free reign by then Mayor Fenty. She implemented many changes including a controversial program call IMPACT which used standardized testing results to evaluate “value-added” teachers. Her successor has sought a probe into a possible cheating scandal involving a high rate of erasure markings on student tests. One has to wonder what impact IMPACT had on the testing results. hmm. Who is Mayor Kevin Johnson? Kevin Johnson is a retired NBA player turned Mayor of Sacramento. He and Rhee were recently married. Among his varied business dealings he founded the St. Hope Academy in 1989. In 2003, St. Hope formed St. Hope Public Schools, an independent charter school system. In 1995 he was accused of Sexual assault and tendered a proposed settlement agreement which would have paid the girl’s family $230,000. The DA decide not to prosecute the case on the grounds that a conviction was unlikely. Another charge involving a 2007 incident with a high school student caused a teacher to resign over the investigation tactics employed by the school administrators which included intimidation of the victim and inappropriate requests of the resigning teacher in whom the student had confided. In 2009, St Hope Academy agreed to a settlement involving payment in excess of $400,000 amidst allegations that it did not appropriately spend AmeriCorps grant money. The third objective under StudentsFirst’s own Policy Agenda pushes Agenda 21’s Sustainability angle. Districts should use resources efficiently to ensure sustainable spending that puts students first. Districts should be managed through structures that ensure a focus on student results rather than adult interests. Let’s take a look at these new governance structures. She wants to implement mayoral control or state-run charter schools. Both of these suggestions remove parental control by dismantling the local school boards in favor of management by politicians who are less accessible or by private corporations. The name of the game is to remove your ability to impact change and to normalize the system. When I say normalize the system, I mean, make sure that any districts within the current system that have active parental involvement and have been successful in protecting the students from harmful policies will be stripped of their power so that the advantage can be neutralized. Agenda 21 is all about sacrificing individual rights in favor of collective rights. While the Wetlands program implements this philosophy in the industries involving raw materials, the Rhee Solution implements this same philosophy in the education arena. School Choice is pushed as a solution to inequality. It is argued that wealthy parents have a choice but the poor do not. Rhee is only interested in a choice among government sanctioned institutions. Her organization seeks to pour public funds into private institutions, to promote voucher systems, and to build charter (corporate) schools. This is a facade. It looks like choice but it is the federalization of all the existing options and it is a communization of the entire system. Once all school options share a common funding source, they will also share a common curriculum and a common regulatory and legal liability. An official investigation conducted by a cold case posse of trained investigators sought to validate the long form birth certificate of President Barack Hussein Obama that was released by the White House in response to Mr. Donald Trump’s public demands. This release was accompanied by a televised speech by our president in which he confirmed its authenticity. The attempt to confirm the contents of the long form birth certificate quickly disintegrated as the electronic version of the document contained anomalies which made it virtual impossible to confirm that a hardcopy counterpart was the source of the document. In fact, the detailed forensics analysis has produced enough evidence to suggest probable cause that a forgery and a fraud has been committed. There was no information released as to who was suspected of these felonies and there has been no conclusion drawn with respect to the president’s eligibility to serve in the oval office. The only conclusion that can be drawn is that the White House released Long Form Birth Certificate is insufficient documentation for the purposes of validating that President Barack Hussein Obama is a natural-born citizen. I am posting the video content that was on display for the media at the public press conference which was held in conclusion of the preliminary investigation. It is not yet known what course additional investigations may follow nor who may take on the responsibility of continuing the investigation. Additional Reference: A Question of Eligibility A 32 Page PDF Document that explores the many facets of President Obama’s life narrative in light of the eligibility question. Trackback: Here is my previous post which expressed my own reservations about this document within a week or two of its release.